서재페를 기다리는 많은 분들의 성원에 힘입어 슈퍼얼리버드 티켓이 매진되었습니다! *무통장 입금으로 예매하신 분들은 부여 받은 가상계좌로 지정된 입금마감일시 전에 입금하셔야 합니다. 입금마감시간까지 미입금된 경우는 예매가 자동 취소됩니다. *2일권과 1일권 티켓은 순차적으로 오픈될 예정입니다. 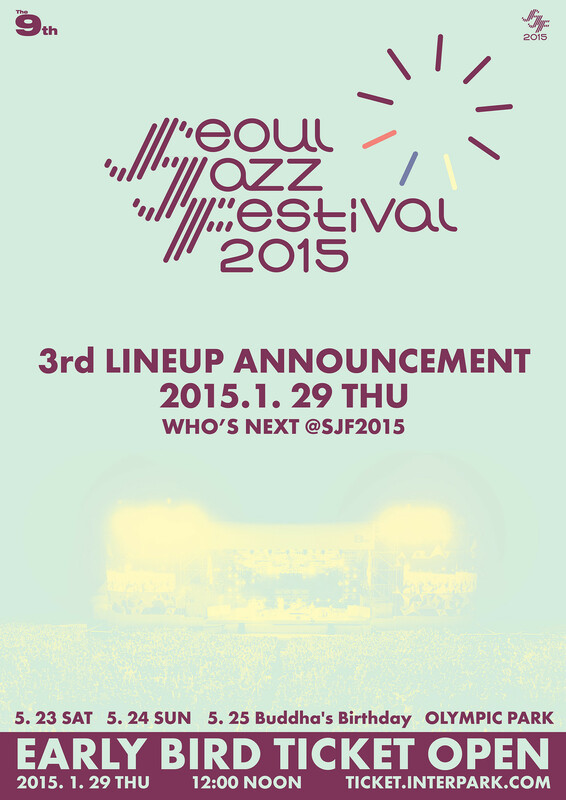 Thank you for all your interest and support of the Seoul Jazz Festival. With all your love, the Super Early Bird Tickets have now been all sold out! On Thursday January 29th, the 3rd Lineup Announcement and the last of the discounted 3-Day Passes, the Early Bird Ticket, will go on sale at 12 NOON! *For those that are making direct wire transfers to our account after having reserved the tickets, the amount has to hit our account prior to the deadline, otherwise it will be automatically cancelled. *The respective 2-Day and 1-Day Passes will also be sold in the near future.